17 years have gone by but so far there are little prospects for the longest war in Afghanistan to come to an end. Lilliputians have paralyzed the Gulliver and brought a standoff in the war. Neither side is in a position to defeat the other. Since time is on the side of the Taliban, a change is discernible in the jingoistic mindset of the US administration under Donald Trump over the last six months. Both the military and civil American leaders are talking of peace which is something new and unique since so far their outlook toward Afghanistan has been to derive an outcome of their choice by using excessive force. All these years, the successive regimes of George W. Bush, Barack Obama and Trump sought to defeat the Taliban on the battlefield, forcing them to surrender their arms, bring them to the negotiating table and then compel them to sign the US dictated peace treaty and arrive at a political settlement. Governed by geo-economics interests, George Bush had initiated the war on terror after 9/11. After occupying Afghanistan in November 2001, ignoring demographic factor he installed Northern Alliance heavy regime and sidelined the majority Pashtuns. In May 2003, Iraq was occupied under trumped-up charges and a Shia regime installed. Torture dens like Bagram prison, Abu Gharaib and Guantanamo Bay functioned unchallenged. Bush used force throughout his 8-year rule and it was during his rule that the apparently defeated Taliban after regrouping had started striking the occupying forces and Afghan forces (ANSF) fiercely. Likewise, Iraqi resistance forces in league with Al-Qaeda gave a tough time to the invaders. Besides the two-front war, the US in collaboration with India and the puppet regime in Kabul had opened a third front against Pakistan which it had declared as an ally, a frontline state and non-NATO ally to fight terrorism. The US and its strategic allies had opted for a secret covert war against Pakistan to extract its nuclear teeth and make it a compliant state. When the militancy in Afghanistan was pushed into Pakistan in 2003/04, the latter had to deploy 100,000 security forces in FATA to combat foreign paid terrorists in FATA. Baluchistan was also heated up in the same timeframe. The troop numbers have now increased to about 200,000 in the northwest. CIA spread its outreach to Eastern Europe and colour revolutions started in the Baltic States during Bush time. China-US and Russia-US rivalry picked up momentum. Blackwater was used in Iraq. Once Obama took over in January 2009, he closed the Iraq front and carried out two troop surges in 2009 under his Af-Pak policy in order to let ISAF under Gen McChrystal and ANSF to quell the Al-Qaeda and Taliban threat. ISAF strength rose to 1, 50,000. The proxy war in FATA and settled areas of Khyber Pakhtunkhwa was stepped up forcing Pakistan to launch military operations in Malakand Division, Swat, Bajaur, South Waziristan and other agencies of FATA in 2009-10. Black Water was inducted in Pakistan in 2008/09 to fan terrorism in urban centres. Quetta Shura was added in the list of accusation in 2011. Pakistan was blamed for terrorism in Afghanistan and Kashmir. When troop casualties of occupying forces in Afghanistan doubled in 2009 and 2010, Obama was forced to announce a drawdown plan starting July 2011 and ending it by December 2014. During this period, not only the Taliban remained aggressive and maintained a dominating edge in southern and eastern Afghanistan, the ISAF faced increased suicide and post-stress disorder cases as well as green over blue attacks. Occupying troops indulged in atrocities through night raids and air war. As a result, Obama initiated a political prong in 2011 and resorted to the strategy of fight and talk and to divide the Taliban. Efforts were made to separate Haqqanis under Jalaluddin and his sons from Taliban under Mullah Omar and pitch former against the latter but failed. No worthwhile results accrued from backdoor parleys because of the insincerity of the US and its allies and the insistence of USA that talks should be between the Taliban and the Kabul government only. This was unacceptable to the Taliban who viewed the Karzai and later the Ghani regimes as collaborators and illegitimate. In 2011, Raymond Davis incident, followed by US Navy Seals raid in Abbottabad and Apache helicopters attacks on military posts in Salala dipped Pak-US relations to the lowest ebb, forcing Pakistan to cut off military relations and close the NATO supply lines for 8 months. Washington had to apologize to normalize the relations. In June 2013, a political office of Taliban was set-up at Doha. When the drawdown was nearing completion, the Pentagon, CIA, Israel, India and Kabul regime prevailed upon Obama and forced him to sign another bilateral agreement with the unity regime in Kabul managed by John Kerry to leave behind a Resolute Support Group (RSG) of 5-6000 to provide training, technical assistance, counter-terrorism and air support to ANSF. The security situation in Afghanistan began to deteriorate after the departure of the bulk of ISAF troops and the Taliban gained total control over 47% of the country’s districts from where they could strike targets in all parts of the country. In June 2014, Operation Zarb-e-Azb was launched by Pak Army in North Waziristan which dismantled all the bases of foreign-sponsored TTP and other militant groups totalling over 60, flushing them out of FATA. Although the major demand of USA was fulfilled, it was, in reality, a setback for the schemers as far as their ulterior designs against Pakistan were concerned. In 2015, quadrilateral peace talks were initiated by the US, China, Pakistan and Afghanistan and Pakistan were asked to use its influence and make the Taliban agree to talk. When Islamabad arranged the talks in July that year and scheduled another meeting in the same month which would have surely made a breakthrough, the spoilers in Afghanistan scuttled the peace process by announcing the death of Mullah Omar. They didn’t want to negotiate from a weaker wicket. Pakistan made another attempt when the Taliban were under the leadership of Mullah Akhtar Mansour. But the latter was killed by a US drone in Baluchistan in May 2016, thereby demolishing the peace process. 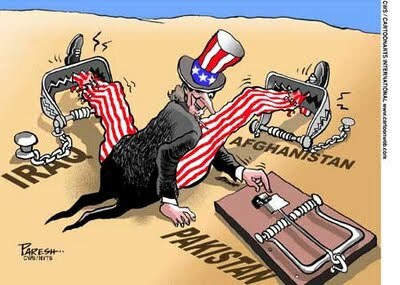 The US wants the Taliban to compromise and accept the US-drafted democracy and constitution, share power as a junior partner, disallow use of Afghan territory by foreign terrorists and to maintain friendly relations with the USA. Like Bush, Obama kept its tilt toward India and visited India twice skipping Pakistan. All big deals with India like civil nuclear agreement, strategic partnership, missile deal, logistics, strategic communications and maritime security agreements were signed with India during Obama’s tenure. The two US leaders have been instrumental in enhancing the presence and influence of India in Afghanistan. When Trump took over power in January 2017, the US was no more a great country. It had lost its prestige owing to failures in Afghanistan, Iraq and elsewhere, uni–polarism had given way to multi-polarism, and the USA had become the most hated nation in the Muslim world because of its anti-Muslim agenda. Instead of taking steps to call off the war on terror, he sheathed the political prong, increased the troop level of RSG to 18000, and gave a signal for a fresh military push against the Taliban to shore up ANSF. At the same time, while announcing his new Afghan policy in August 2017, he put the whole blame of instability in Afghanistan upon Pakistan, and not only accused it of providing safe havens to the HN and Afghan Taliban but also supporting them. Since then, Pakistan is on notice and there is no letup in his belligerence. Punitive steps have been taken to compel Pakistan to do more. These include disinformation campaign, threats, suspension of reimbursement of CSF, putting Pakistan in the grey list, suspending military training, and directing IMF not to provide loans for repaying loans to China or for CPEC, provoking India and Afghanistan to step up hostile acts against Pakistan. Over one year has lapsed but the US military and ANSF have failed to turn the tide in their favour. Taliban have now started fighting battles in provincial capitals Lashkargah, Ghazni, Farah, Zabul, Uruzgan and Kunduz. Kabul and Bagram have been attacked repeatedly. They now control about 65% of the territory. While the Taliban have expressed their desire to hold talks and that too with the US only, they are not desperate for talks. They know that the wind is blowing in their favour. The US, on the other hand, is desperate for peace since the ANSF lacking in fighting spirit and rived in discipline problems cannot defeat or even contain the Taliban, and are in disarray. The unity government is tumbling due to inner rift, inefficiency, corruption and unpopularity. The RSG is fast losing heart and is feeling insecure. The general public has now started holding protest marches asking the foreign troops to quit. Home pressure is building on Trump asking him to exit from the quagmire of Afghanistan at the earliest since it has become a drain on country’s economy. The TTP created by Indo-US-Afghan nexus to defeat Pak military is in tatters. In anger, Fazlullah was killed in June 2018. India which has been made a leading player has abstained from helping in reversing the dipping fortunes of the USA in Afghanistan. The US has lost its leverage over Pakistan after closing the taps of military aid and training. Pakistan has refused to get intimidated and is veering towards China and Russia. The prospects for peace talks brightened when a 3-day ceasefire was religiously implemented on the occasion of Eidul Fitr in June. The two warring opponents mingled and embraced each other and took selfies. The effectiveness of the truce during which the Taliban laid down their arms, and then resumed fighting after the truce signalled how much control the Taliban leaders have over their fighters. It was under such distressful circumstances that the US agreed to hold preliminary direct talks with Taliban at Doha for the first time on July 28 to find a way out for restoring peace. Its willingness indicates the urgency to end the conflict. This comedown is seen as a diplomatic victory for the Taliban. The latter is no more solely dependent upon Pakistan since Russia, China, Iran, Qatar are supporting them. Moscow had invited the Taliban, US and Kabul for peace talks, but the latter two declined. Increased interest of Russia in Afghan affairs is another factor which is impelling the USA to patch up with Taliban. The second direct talks are likely to be held this month, in which the issue of release of Taliban prisoners from Guantanamo Bay will be discussed to create an amiable atmosphere. The Taliban are showing flexibility in their stance by not insisting on occupying forces to withdraw first and then hold talks. They now want a firm timetable of withdrawal and do not agree to retention of even a single military base as desired by the USA. They would certainly seek a larger role in the future government. 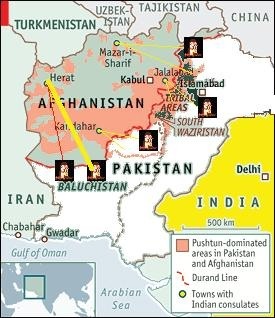 One of the major reason for Russia and Iran to support the Taliban is the presence of Daesh (Khurasan) under Wilayat Khurasan (WK) who were brought and settled in Nangarhar and married with Jamaat-al-Ahrar by CIA-RAW in 2014 to fight the Taliban as well destabilize Pakistan. Russia and Iran are also opposed to the US-led reconciliation. Central Asian Republics (CARs) are also wary of Daesh who have an international agenda. Having seen the fate of Syria at the hands of Daesh, the Taliban are also desirous of peace and are seeking the cooperation of other regional countries. They are suffering since 1978 and have learnt lessons and would not like to commit old mistakes and get isolated in the world comity. They also do not want the recurrence of 1991-94 like civil war, or Syria like conditions and like to have a peaceful transition of power. They have given an assurance that unlike al-Qaeda and Daesh, they have no international agenda. They opened communications with Russia, China and Iran which enabled them more avenues of arms supplies to continue with their freedom struggle with greater vigor. But the fact is that no one wants the US to pull out abruptly and ignites another civil war. Notwithstanding the desire for peace by Haibatullah, it must not be overlooked that he has opponents within the Taliban movement who are opposed to him and to peace talks. Rahbari Shura and HN have little appetite for peace talks. Quetta Shura leaders particularly WK linked with HN oppose Haibatullah. It is owing to internal strife that Haibatullah wants to consolidate his position and negotiate from a position of strength after achieving major victories in the battlefield. He aims at capturing a provincial capital. It was with this end in view that big efforts were made to capture Kunduz and Lashkargah and lately Ghazni. While the Taliban have the capability to capture a city but do not have the capacity to retain it as had been seen in Kunduz. The US was at ease as long as Kabul, provincial capitals, strategic communication lines and its eight military bases were safe. Attacks on Kabul and other capitals have unnerved the military forces. What is most worrisome for the US is that it is losing on all counts and finds itself in a nutcracker situation. It can neither afford to exit as a defeated superpower nor can it stay for long. It has lost the war but is not acknowledging it and badly wants a face-saving formula. It can exit only through Pakistan and not via the northern network which is no more available to ship out heavy baggage. The US is faring poorly on all other fronts including the domestic front where Trump has become highly unpopular. 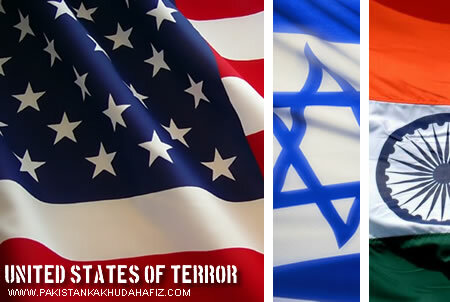 Both Pakistan and Taliban are defiant and holding their ground. Judging from the mood of new Pakistan in which the civil-military leadership have come on one page, it cannot rule out the fast emerging possibility of Pakistan slipping out of its hands and shifting to Russo-Sino camp, which could be joined by Iran and Turkey, both antagonist to the USA. The US has realized that the ANSF has become a liability, and Ghani-Abdullah unity government is not delivering. While Indo-US-Afghan nexus had yet to absorb the shocks of near demise of TTP, and Pakistan’s decision to repatriate Afghan refugees, the trio got another shock when Pakistan undertook the construction of 830 km fence, and over 400 border forts, along some of the world’s harshest terrain – the Pak-Afghan border last year. Work is expected to be completed by 2019. Why would Pakistan exert such monumental effort, allocating thousands of troops and required logistics for this undertaking? Perhaps Pakistan grows weary of waiting for other ‘vested’ interests to fulfil their promises. It is strange that the US, the Afghan regime and India are objecting instead of assisting to prevent the alleged cross-border infiltration from both sides. Obviously, it would block the covert war. Finding itself cornered with very little room to manoeuvre, it appears that Washington has now decided to make one last attempt to secure its mercantile interests in the region at a low cost. To this end, it has once again appointed former American ambassador Zalmay Khalilzad in the USA as a special envoy of Af-Pak region. He served as an ambassador in Kabul for 5 years during Karzai rule and he had great influence over Karzai and his administration. Being a Pashtun, he has had access to key areas and had developed a relationship with Mujahideen leaders including Hikmatyar during the occupation of Afghanistan by Soviet troops. He has an ill reputation of inflicting extreme torture and excesses upon the Afghan Pashtuns. It seems another plan has been hatched as a last resort to re-enact the reign of terror in Afghanistan. After inducting Daesh, the US is actively considering to induct Black Water in Afghanistan and hand over security duties to it and kill key leaders of the Taliban. Eric Prince has already undertaken two visits to Kabul. Blackwater was initially inducted in Afghanistan during his last tenure and he had a big hand in the persecution and slaughter of militant Pashtuns. Khalilzad and Blackwater coming together once again may not be a coincidence and possibly a repeat action could be in the offing. Khalilzad wants to regain contacts with old Mujahideen leaders and also help Hikmatyar in winning the election and in paving the way for the exit of US troops and formation of a new regime. He is likely to play a role in the next presidential election and possibly in bringing Karzai and his team back in the saddle. From the above, it is evident that the US is not interested in peace since it wants to extract mineral resources of Afghanistan and Central Asia and to accomplish its agenda of denuclearizing Pakistan. India is also anti-peace since it wants to retain its presence to encircle Pakistan and to gain access to CARs through Pakistan’s land corridor. The Kabul government is also not keen since it knows it will crumble and ANSF will splinter soon after the exit of occupying forces. Peace talks are a ruse to throw wool into the eyes of the world. Had the US been sincere in arriving at a viable political settlement, it should have accepted the basic demands of Taliban such as freeing of prisoners, putting them off the blacklist, allowing them freedom of movement, unfreezing their accounts, curtailing human rights abuses and making them a stakeholder. Peace talks could be a deception to widen the existing rift within the Taliban and exploit it by pitching WK against Haibatullah. Similarly, the US should not have distrusted and maltreated Pakistan because, without its wholehearted cooperation, peace is not possible. It should have acknowledged its huge sacrifices in a war it didn’t ask for, nor did it initiate. It should have lauded the efforts of Pakistan, the only country in the region to turn the tide against militancy – despite heaviest odds. It should not have prioritized Indian interests in Afghanistan over ours and pressured Pakistan to grant land access to India for trade with Afghanistan/CARs. The US must not forget that in the war against the Soviets in the 1980s, America spent billions of dollars destroying the region but practically did nothing to rebuild much of the destroyed basic infrastructure, forcing millions of Afghan refugees to flee to Pakistan where, according to UNHCR reports, approximately 1.38 million registered and one million unregistered remain sheltered to this day. The US callously overlooks the human and financial sacrifices Pakistan has made, including 70,000 war-related civilians and security forces injured or killed; and a financial loss of $ 120 million. Stable, peaceful and friendly Afghanistan is vital for Pakistan since it frees Pakistan of twin threat to its security and plays a part in dictating our relations with the US and India. It is with this end in view that earnest efforts have been made to appease the US-installed regime in Kabul which have so far borne no fruit mainly due to the role of spoilers. FM Qureshi visited Kabul on Sept 15 with the hope of melting the ice. He seems satisfied saying the visit was ‘advantageous’. Taking a cue from the frivolous statement of the US Ambassador in Kabul, Pakistan should remain vigilant that in its enthusiasm to melt the ice, it shouldn’t barter away national interests. Any concession to India regarding trade corridor should be linked with the resolution of Kashmir dispute and end to clandestine operations against Pakistan by India. What should be understood by Ashraf Ghani and Dr. Abdullah is that the war is unwinnable, and the only way to end the war is through a negotiated settlement with the Taliban. Pakistan can play a constructive role in the Afghan-led and Afghan-owned peace process and is in the best position to bring all sides together and work for a détente. Pakistan will have to promote its counter-narrative cogently to convince the world that it played a lead role in the war on terror, was the biggest victim of terrorism, and has achieved the best results. Pakistan should remain watchful of the designs of Indo-US-Afghan nexus, be prepared to take on the emerging threats of Daesh and Black Water, speed up fencing and return of refugees, deal effectively with internal enemies promoting foreign agenda and find ways and means to deal with the catastrophic effects of hybrid war attacking the homogeneity of the society.